Dell is making updates to its Android-based, thumb-size PC called Wyse Cloud Connect -- widely known as Project Ophelia -- as the company moves to make the stick computer suitable for consumers. A new consumer-friendly user interface for Wyse Cloud Connect is in the pipeline, said a company spokeswoman in an email. Consumer purchases of the device have been minimal, as the product is mainly being bought by enterprises, but a consumer marketing strategy is being planned. The US$129 Cloud Connect, which looks like a USB stick, can turn any TV or display into a PC. The device runs on Android OS and once plugged in through an HDMI port, allows users to run applications, play games, watch streaming movies or access files stored in the cloud. Users can download applications from Google Play Store. 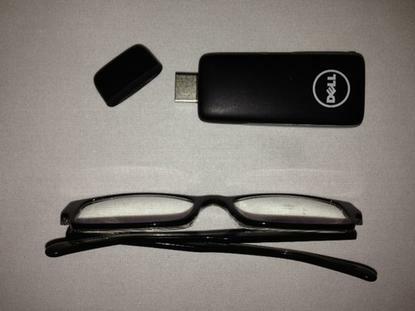 "This happens to be a little thin client that fits in your pocket and in the monitor," said Dan O'Farrell, senior director of product marketing at Dell Wyse. While it may have tablet-like usability, Cloud Connect has found interest among enterprise users as a virtual desktop. For example, users can connect the device into hotel TV sets and connect to applications running on servers or remote desktops. But one issue in this scenario is the lack of a keyboard or mouse, a problem Dell is solving through new software called Cloud Connect Controller, which turns any tablet or smartphone into a wireless keyboard. Through Cloud Connect Controller, a smartphone or tablet will connect directly to the thumb PC via Bluetooth. This removes the need for users to carry separate Bluetooth keyboards to type. The software will be available in Google Play store, O'Farrell said. It was announced at the Citrix Synergy conference, which is being held in Los Angeles this week. Dell is also taking steps to make the Cloud Connect PC a standalone device. Right now buyers need to buy a license for the Wyse Cloud Client Manager software so the PC can be configured and managed remotely. Dell is removing those requirements, which should allow consumers to use the device with no strings attached. More updates to improve the functionality of the Cloud Connect PC will be announced soon, O'Farrell said.